Nepal prides itself on its abundant cultural heritage. These include Lumbini, Janakapur, and the Kathmandu valley, to name but a few. It should be noted that this cultural heritage of Nepal is closely linked to the Japanese traditional culture through the underground stream of history which permeates both our cultures. In fact, many Hindu and Buddhist deities worshipped here in Nepal are also revered in Japan. Indra, Ganesa, Sarasvati, Mahakala, Bodhisattva Manjusri, Bodhisattva Avalokitesvara or Lokesvara, Sakyamuni Buddha, and Amitabha Buddha are some of the examples of such Nepalese deities which have widely attracted the worship of the Japanese people. The Hindu gods and goddesses worshipped in Japan today were originally introduced to Japan from China as an integral part of the Buddhist pantheon. These Vedic and Hindu deities had undergone certain transformations in terms of their appellations, characteristics and even appearances in China in the course of acceptance, especially through the process of translating sutras and	transliterating Buddhist terminology from Sanskrit to classical Chinese. Let me cite two of such examples below. Among the Hindu goddesses worshipped in Japan, perhaps the most popular goddess even today is Sarasvati. Just as Nepalese Sarasvati is depicted sitting on a lotus pedestal (padmasana) and playing the vina, Japanese Sarasvati(called Benzaiten or Benten) is holding a traditional Japanese musical instrument biwa(the Japanese counterpart of vina) in her arms. In Medieval Nepal, Sarasvati was quite popular. A large number of people visiting her shrine of Swayambunath on the Sri Panchami Day is a reminder to such a historical fact. While in Nepal, she is represented as a beautiful goddess of learning and the arts, in Japan she has rather attained importance as a beautiful goddess of fortune, which was originally a basic attribute of goddess Laksmi. So, the Nepalese saying that Laksmi (wealth) and Sarasvati (learning) rarely come together does not apply to the Japanese context. True to the original account of the Vedas that Sarasvati was a river goddess, Japanese Sarasvati is almost always associated with water and her shrines are built either on beautiful lakesides or seasides. 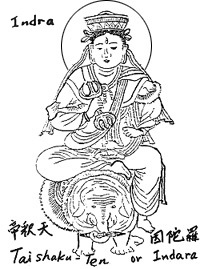 Indra is also a popular god in Japan. His vahana (vehicle), elephant Airavata, was reduced in size to a horse there, due to the fact that ancient Japanese never had an opportunity to see a real living elephant. There is a famous movie serial in Japan named Futen-no-Torasan (Mr. Tora, a hobo). Mr.Tora, the Protagonist in the movie, used to declare proudly that he was born and bred in Shibamata, Katsushika, which is a downtown area of Tokyo, and he received ablutions in the temple of Indra (Taishakuten) when he was born.